You are currently browsing the category archive for the ‘Harrisburg’ category. Come See My Band on July 19th! Come up to Camp Reily just north of Harrisburg for a late afternoon of music from my band, the Durable Goods. We’ll be playing Woodstock-themed sets for the Historical Society of Dauphin County‘s annual “Blast From The Past” show. We’re looking very forward to this gig and are hoping you’ll join us from 3pm-8pm on Sunday, July 19th for food and fun. Rain or shine. Tell your friends! Hope to see you there. All the details are at the HSDC website. I’ve been aware of the recent criminal activity at the Harrisburg Mall lately, but it hit home today. One of Melissa’s coworkers was the victim of an attempted robbery at knifepoint last night in the mall’s parking garage. Luckily for him, he fought back, subdued the criminal, and called the police. I usually only go to that mall to visit the excellent Great Escape Theater, but between the crime and fluctuating tenants that’ll probably be it for me. It’s ironic that the mall isn’t secured well enough to repel criminals: it sits next door to the Dauphin County Prison. Who’s going to clean the Mall up? On Thursday we had Verizon FIOS Internet/TV/Phone service installed; we were previously Verizon analog phone customers and had Comcast TV/Internet service. After using the new service for a few days, I’m pleased with the Internet and blown away by the TV – more about that later. Some of my neighbors made the switch from Comcast to Verizon FIOS recently, and with the free installation and temporarily free equipment Verizon was offering, it was time to try it out. Before we ordered FIOS I called Comcast and gave them a chance to keep our business by offering us more TV services for a similar price. We had kept our Comcast bill low for years by not subscribing to the “Standard” service tier, which meant we had a big gap between the Basic channels and the ones we were getting on Digital Preferred. We’ve also had the HDTV/DVR services a number of years. To compete with what we’d get with FIOS, Comcast would have had to give us the Standard tier for free (minus the extra HD stations to match Verizon FIOS TV Essentials that we ordered). They wouldn’t commit to any deals beyond 6 months, so we ordered FIOS. To prepare for the FIOS install experience I read forum posts and talked to neighbors and friends who had recently ordered the service. I was pleased when I found out that the Internet and TV services would share the existing coax wiring (like Comcast) because it meant that no new wires would need to be run. The FIOS ONT box and its battery backup were small enough to fit comfortably next to the other utilties on our basement wall, right near all the coax leads and the telephone punchdown block. I had mounted a surge protector near there to prepare for the install, and the system was plugged into that. Verizon had committed to starting the install between 8-Noon on Thursday at the time of the order and they had followed up with automated and human calls over the 2 weeks prior to confirm that we were still on schedule. They estimated 4-6 hours of install time. I got a call from the installer (Bill) around 8:30 Thursday morning to let me know he’d arrive soon. He arrived at 9:30 and the install lasted until about Noon. I worked with him when required and did proactive testing on my computers, which really sped up the process. The Internet service is delivered through a nicely-appointed Actiontec MI-424-WRv2 wireless router. For the TV service we got the Home Media DVR for the family room HDTV and a standard-def box in the master bedroom. The cable boxes took about 20 minutes to activate over the Internet service; once done, Bill gave me a demo of their features. They’re Motorola boxes similar to what Comcast uses, however the gorgeous menus and their responsiveness leave Comcast in the dust. Two really cool things we get with the Home Media DVR include the ability to watch SD stuff we’ve recorded on the upstairs box and Media Manager software, which lets a computer on the network serve pictures and videos to the DVR. I’ve played with the pictures so far. There’s also a feature that lets you interact with your DVR over the internet, but I haven’t set that up yet. The router is full featured and has advanced settings like Q0S that I will be digging in to to optimize Skype and move things like FTP and Bittorrent to low priority. It has an easy-to-use web interface that clearly shows you the devices that are on the Ethernet, Wireless, and Coax networks (including the cable boxes). I quickly opened up RDP and FTP services for my server and verified that was working within the first hour after the install. They’re similar, as I expected, but notice the much lower ping time with Verizon. 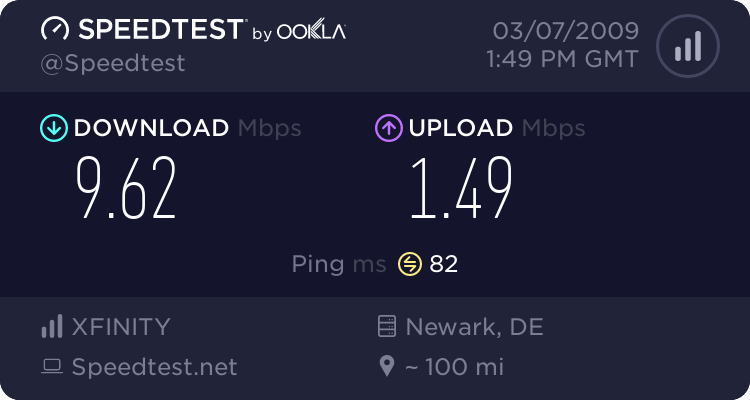 I’m pretty pleased with the internet performance I got from Comcast. The reason we moved to FIOS was the difference in TV services for the price, as well as to get better telephone services like flat-rate US long-distance calling. Speaking of price, we’ll see how the two vendors compare after our initial promotional pricing expires. We were paying about $120/month ($90 Comcast/$30 Verizon) before and I think we’ll be paying about $110/month to Verizon for the first year an then about $130/month in the second year. The one thing that didn’t get set up on Thursday was our Verizon Online account, but I was able to quickly do that over the phone with a Verizon customer service rep on Friday morning. They give you up to 7 accounts that have email/newsgroup/web services. I couldn’t get “aharden”, but I did get “aharden3”, “alexharden” and “alex.harden”. I may even go ahead and get accounts for Ryan and Zachary so they’ll be waiting on the boys when they’re old enough. We used the DVR to play back some of our series recordings last night and it works just as good as Comcast’s. The menu navigation is very different. One difference from Comcast that I like is that the box doesn’t display the timeline bar as you’re skipping around the recording. The FIOS TV remote is well-laid out and isn’t requiring much time to get used to. Unlike the Comcast DVR remote, keys for skipping both forward and backward are provided. I had to program a macro key on the Comcast remote to get the skip forward feature. On Demand content is roughly the same between the two carriers, but one thing I noticed was that Verizon charges $6 for new HD movies. 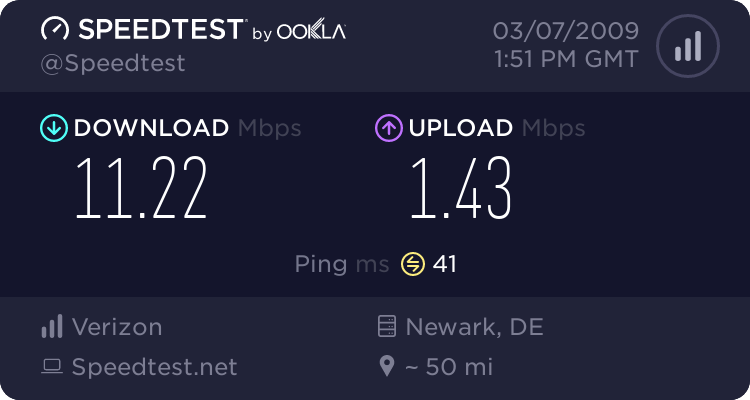 Comcast charges $5. Let me know if you have more questions about the FIOS service. I’m sure I’ll post more as I continue to use it. In PA, school and events are sometimes canceled before winter weather has even had a chance to appear on radar. The meteorologists around here do pretty good at estimating temperatures, but the mountains make it hard for them to make accurate precipitation estimates. Regardless, their opinions hold a lot of sway. In New York, it seems like residents expect that NYSDOT and municipalities will keep the roads passable unless there are blizzard conditions. In PA (at least here in Harrisburg), it seems like people assume that PennDOT and municipalities won’t be able to treat the roads, all predicted snow and ice will show up and accumulate, and we should all just stay home. Those assumptions are sometimes accurate, especially for secondary roads. It’s getting a bit frustrating. Only two more days until the election. I think I’ve made my decisions. I’m not voting a straight ticket, that’s for sure. President: Barack Obama (D). Regardless of the rhetoric, and having to choose between him and McCain, I think he will best lead our federal government and will best represent our country to the rest of the world. He’s run a relatively consistent and thoughtful campaign. I wish he hadn’t spent so much of the campaign dollars he received on big media buys, though. State Senate: Judy Hirsh (D). Jeff Piccola’s relentless negative campaigning cost him my vote. Judy Hirsh attacked his political record when she called him “do-nothing”. He sent mailer after mailer to my home with pictures of her looking like an alien, attacking her for having a house in Florida, and citing her personal financial troubles. Looking at the issues, I’m very against Piccola’s view that no portion of property taxes should fund public schools. State Representative: Ron Marsico (R). Marsico’s running unopposed this year. US Representative: Toni Gilhooley (R). Tim Holden (D) doesn’t have much of a presence around here and I’m not very aware of how he’s represented our district in Washington. He didn’t film a video for WITF’s Open Access program, so that shows me that he’s not trying to earn my vote. Like most other US Representatives, he hasn’t responded to the Change Congress pledge. His campaign funds are supposedly flush with PAC money. In her Open Access video, Gilhooley touched on issues I think are important. PA Attorney General: Tom Corbett (R). I haven’t investigated this campaign and sticking with the incumbent seems like a safe bet. PA Auditor General: Jack Wagner (D). Another incumbent vote. I don’t think there is a challenger in this race. The first visible signs of the economic crisis are starting to show up around here. I passed several gas stations today where unleaded was $3.09. My 401(k) is 32% down for the year. However, I’m optimistic. I’m good at my job and make a decent wage; so does Melissa. We don’t plan to retire for at least another 25 years, and don’t have debt other than our mortgage and cars. I just hope that the market gets strong during the next 10 years so that Ryan (and seven years after him, Zachary) will have plenty of money for college. If you aren’t too strapped already, this is probably a great time to think about investing in funds or companies you believe will bounce back. Don’t listen to financial talking heads; aside from a few like Robert Reich I think they’re mostly air. Screw it. I’m not a regular Rite Aid customer anyways. They could have just settled the matter in principle by offering me the $3 I thought I was saving in the first place, but they didn’t. This program seems to me to be a way for them to trick people (which, being a drug store, probably includes a disproportionate number of older people) into buying stuff they might otherwise not have chosen if it wasn’t perceived to be on sale. I don’t know if CVS does this too, but I’ll be a lot more careful about reading deceptive shelf labeling. Don’t shop at Rite Aid if you have an alternative. It’s a shame that a Central-PA-based company is preying on their customers in this fashion. Ryan and I went camping with four other scouts in his pack during Partner and Pal weekend at the Keystone Area Council‘s Hidden Valley Scout Reservation. I recently learned about the camp from others in our pack, and was very impressed by it. The camp’s infrastructure and staff were great and the kids had a lot of fun. We had three former scouts (two who were Eagles) among us five adults who had been to the camp as kids. We had a very active Saturday since the weather cooperated beautifully. Ryan enjoyed shooting a BB gun, archery, swimming, learning about cooking and knots, as well as seeing the skits and other entertainment that was prepared for us. The food was great and plentiful. I’m looking forward to our next camping experience there, which might be as early as this winter. It’s been a while since I’ve blogged about the upcoming DTV transition. The DTV coupon program is in full swing and converter boxes are widely available. I got my two $40 coupons a few weeks ago and bought my first box yesterday. Based on reviews at AVS Forum and the comparison on Wikipedia I chose to get the Zenith DTT901. Circuit City showed them in stock in their Harrisburg East store, so I picked it up from there. I already had a Radio Shack ATV 1000 combo VHF/UHF/FM indoor antenna, so I plugged that in to the DTT901. I was pleasantly surprised when I performed the first auto-scan and received all the local digital stations clearly except for WPMT-DT (Fox). I haven’t yet tried to adjust my antenna and manually tune in Fox, but I’m not all that concerned since I’m setting this up mainly to give us TV access in the event our cable goes out. However, I like the ability to choose 16:9 or 4:3 for HD/widescreen shows and the 4:3 picture I get from the DTV is noticably cleaner than what we get over cable. Checking back in on my DTV post of over a year ago, I think Mark Cuban’s comment hits the mark. At the time I was convinced that the broadcast networks would go native widescreen and not worry about 4:3 protection. In the meantime, they’ve moved their corner bugs in and graphics are 4:3 safe. Our local stations (along with most others, I presume) aren’t producing any HD content. Even WGAL and WHTM switch their HD feed into SD mode to do graphics overlays for station ID or weather alerts. What remains to be seen is how cable providers will feed analog cable customers. Will they have a choice of aspect ratios or be force-fed 4:3? I really like the DTT901. It’s small, has low operating heat, and its remote is small and simple. I like being able to quickly zoom/crop the HD channels to optimize viewing. I’ll probably buy another one with my second coupon. Yes, it was a beautiful day in Harrisburg. We have our two new trees in and growing, bushes are trimmed, beds are mulched, trees are fertilized, planters are deployed, and we still have four new bushes to plant!